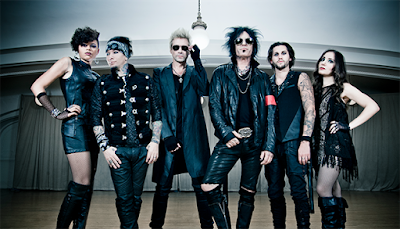 MetalRockNews: Sixx:A.M.: "Don't be evil, Youtube"
Sixx:A.M.: "Don't be evil, Youtube"
Sixx:A.M. criticized YouTube and Google over the royalties it pays out for music video streams. The band has released a statement calling for the Google-owned site to pay more to musicians for using their videos. A number of artists signed a petition last month to reform the DMCA (Digital Millennium Copyright Act) in the U.S., arguing that the current legislation "threatens the continued viability of songwriters and recording artists to survive from the creation of music." They have taken issue with section 512 of the Digital Millennium Copyright Act, or the notice-and-takedown provision, which protects YouTube and other services from liability when users upload copyrighted material without consent. "It has allowed major tech companies to grow and generate huge profits by creating ease of use for consumers to carry almost every recorded song in history in their pocket via a smartphone, while songwriters' and artists' earnings continue to diminish," the petition letter reads. The band wrote: "We recently completed our fourth album called Prayers For The Damned, in our singer/producer James Michael’s recording studio. We are a lucky band, grateful to have all had success prior to the creation of Sixx:A.M. Nikki came from Mötley Crüe, DJ played guitar in Guns N’ Roses for the past six years and James has had a successful career as a writer and producer. Releasing an album and being part of a tour going on sale, allows us to use the promoters marketing money to create a larger platform to get our message out, and having a record company that generates publicity gives us an opportunity to speak up about issues we think are important—specifically the crisis with the music business and YouTube. Sixx:A.M. has always been vocal about artists’ rights. We stood with Taylor Swift when she spoke up about the absence of royalty payments to artists by Apple Music (http://bit.ly/1NKedrx). The band has also long been an advocate of new artists, and Nikki has featured them heavily on his radio show, Sixx Sense, and via his social media. We chose today to speak up about how YouTube unfairly pays artists and labels an estimated 1/6 of what it’s competitors, Spotify and Apple pay and why this must be addressed, along with a revision of the antiquated Safe Harbor provision of the Digital Millennium Copyright Act (DMCA). YouTube’s parent corporation, Google, has the second highest market capitalization in the world and its two founders, Larry Page and Sergey Brin are worth a combined $75 billion, and total 2015 revenue of Google was $75 billion. The total annual revenue of the global music business, in comparison, is less than $15 billion. We have deep respect for Google’s spirit of innovation and YouTube’s contribution to the field of technology and entertainment, in fact the data we are citing comes from Google itself, but the facts don’t lie: Our large community of hardworking artists is being exploited to make a very small percentage of people extremely rich. This is an important issue to us. We are the lucky ones, like so many veteran artists, who came up in an era where there was much more income from record sales. Today, streaming is a fraction of income from that time. This is not about us. We are speaking up for the current and future generation of musicians who must be compensated fairly for their hard work. We would not have had Prince, Blondie, Bruce Springsteen, Ice Cube, Taylor Swift, or many other artists without a system to support and nurture them. We support technology and its ability to bring music to more people around the globe. All we ask, is for ALL artists to receive fair pay. When Google first started, its corporate motto was “Don’t Be Evil.” That motto has since changed to “Do The Right Thing.” It’s time to live up to your corporate mottos, Google and YouTube, and invest in the future of music."